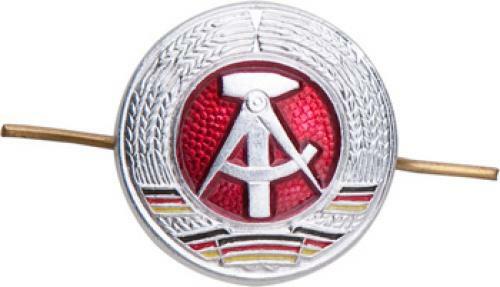 A small metal cockade with the East German coat of arms. A very ostalgic character could stick this in every piece of headwear they own. About 15 mm diameter, with traditional two-prong attachment - you just stick them through the fabric and fold to the sides. Make small pilot holes if necessary. Needless to say, these are real deal DDR stuff - copies won't be made in the next 300 years. Not much to say, just an unissued brand new pin. Honecker would be proud.